When all this polish arrived on my doorstep, I contemplated breaking it up into several prizes. But it's so much cooler to hand them over to a single winner, right!? For a confirmed polish addict...it will be a welcome addition of 31 new polishes to their stash. For a total newbie...it will be an instant "Polish Hoarder" starter set! As promised, I'm going to swatch every polish in the giveaway over the next week. So each day you'll see six new polishes. At the end of the week, I'll do a wrap up post showing all of the polishes. Sound good? Okay, before I start on the individual reviews, please remember I can't attest for wear time since I typically only wear a polish for one day. But I'd definitely welcome your feedback if you have any experience (good or bad) with these polishes. Also, every swatch you see is topped with a coat of Seche Vite. And as I mentioned in a previous post, there are several polish names/descriptions that don't match the list on the Pure Ice site. I was going mad trying to sort it all out. I'm just going to run through the polishes exactly as they'll be gifted to the winner and will make a note if I noticed it was different. So let's get started! Right out of the gate...I love this one! It reminds me of China Glaze Ruby Pumps. It's a deep red base with dense, deep red microglitter. It went on smooth and was opaque in two coats. This polish is an ultrafine, dense gold and copper glitter. I used it as a topper over Kissing Cupid (a burgundy you'll see in a future post), but you could really use this one alone. The texture and colors remind me of China Glaze I Herd that. But while I Herd That has more copper than gold, Playtime has more gold than copper. 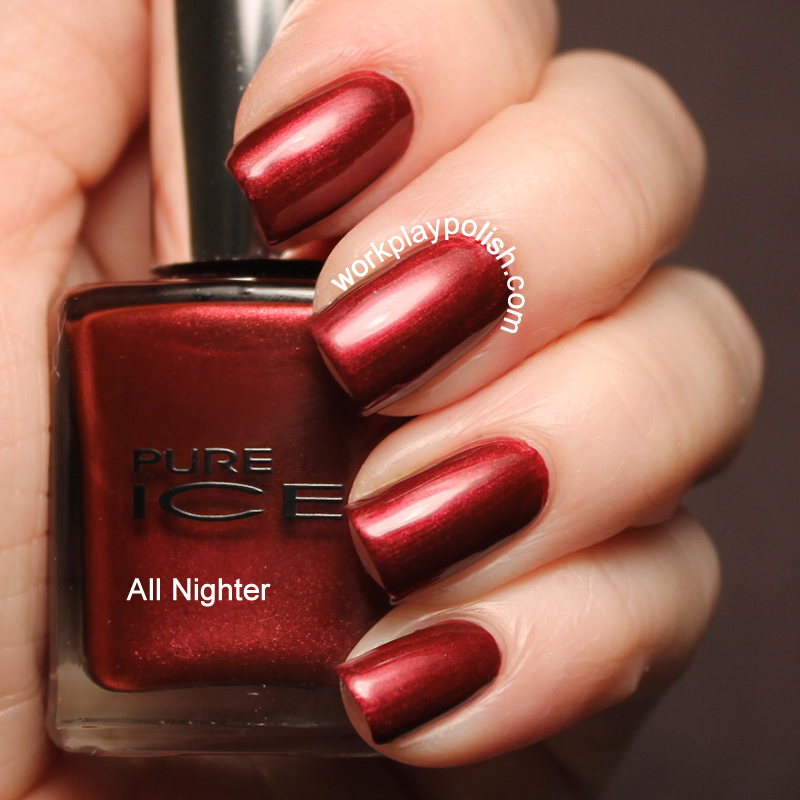 *Note that the Pure Ice site says this polish also has red glitter. Twinkle is a clear base with magenta microglitter and hex glitters. I'm showing one generous coat layered over Pure Ice Purple Rain. This is very similar to Garter My Belt, also part of this collection. I'm curious as to why they included both. In any event...this is a very pretty, chunky glitter. This is a shimmery maroon. The finish really gives this one some depth. I like the color, but it seems a little dated to me. Application was a breeze and it was completely opaque in two coats. My Wonderland is another ultrafine glitter. It's a beautiful combination of turquoise and green sparklies. I layered two coats over The Secret Is Out (which you'll see swatched later). This is really a stunning combination. *Note: Pure Ice calls this a dark green glitter. Red Hot Mama is a medium red, almost burgundy in two coats. The color is actually deeper than what I captured in my photo. It has a great formula and would be a good stash staple red. 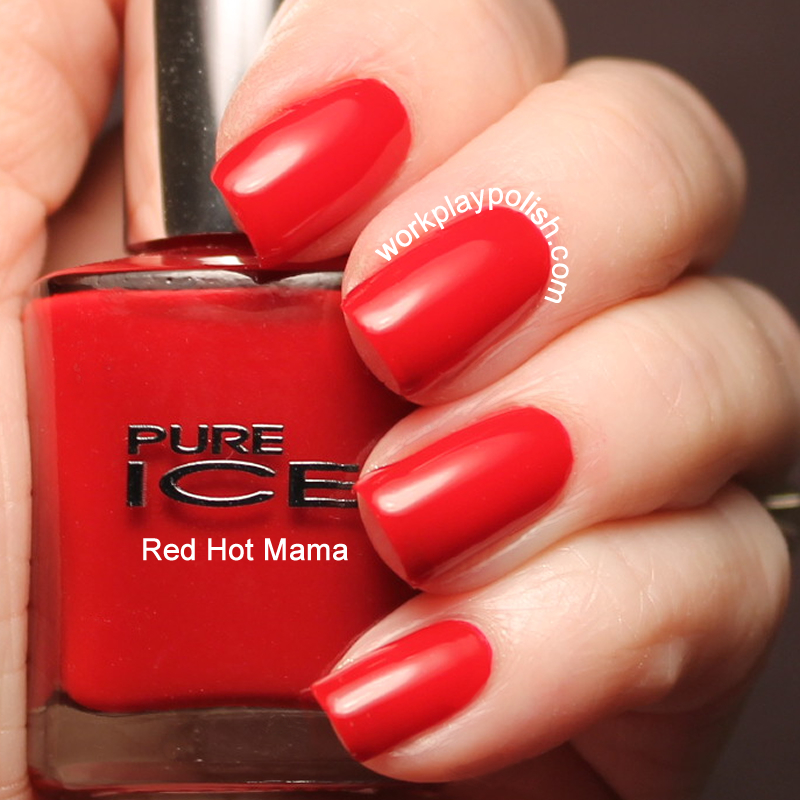 *Note that the Pure Ice site does not list this polish as part of this collection. I believe this may be a renamed Siren. So that's the first six. Don't forget to enter my Pure Ice Giveaway! Check out the gallery to see larger versions of the pics. Pure Ice is available for $1.97 at Walmart stores nationwide. Some Pure Ice polish is available online for $1.99 at Bari Cosmetics, Ltd.